The Adidas Deluxe nylon lumbar belt has been designed to protect your back during weightlifting. The belt is made from sturdy Sturay Nylon and has an easily adjustable Velcro closure with a durable, heavy duty metal loop for a comfortable fit. The belt helps to complement and assist the muscles of torso during strength-training workouts and is great for heavier lifts. for submitting product information about Adidas Deluxe Nylon Lumbar Belt We aim to answer all questions within 2-3 days. 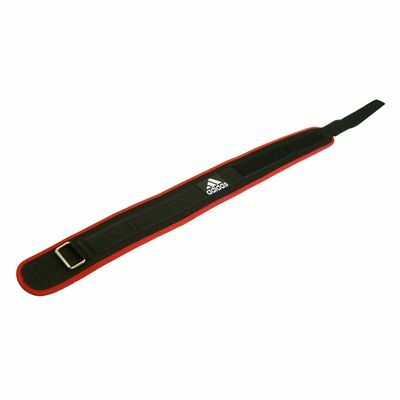 for submitting product information about Adidas Deluxe Nylon Lumbar Belt. We aim to answer all questions within 2-3 days. If you provided your name and email address, we will email you as soon as the answer is published. The Adidas Deluxe Nylon Lumbar Belt Medium size, what waist size does it fit? for submitting product review about Adidas Deluxe Nylon Lumbar Belt.